Don’t miss any points! Join worship leaders and worship teams from the Providence, RI area for a weekend inspiration, creativity and transformation to lead our churches in worship! Have you always wanted your team to go to the next level? Now you can. Heart and skill work together to produce quality. It’s not about the destination, but about the Lord infusing our spirit, and to fan into flame the gift of God. Show #109 @ 11am 2-7-17: What Your Singers Should Know About Mike! Want to watch MORE Worship Training Video? 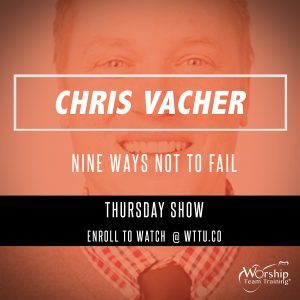 Want to watch MORE Worship Training Videos? If you win it big this time, you’ll have to top it again the next time. Most people think in the moment – about the win, but not about the outcome, the aftermath or where the next step will lead to the next victory. So how do you help yourself and your team win by avoiding the failure? Here’s nine ways to help you don’t fail, so you can win, the next time for the next win. CLICK HERE TO WATCH TRAINING + ARTICLE! True worship techs put the needs of others above their own. However, not every member in the worship ministry has the same attitude, so how can we all get on the same page? Relationships are based on sincere concern for the team, a desire to reach the church, and a personal drive to perform at the highest level. CLICK HERE TO WATCH TRAINING & ARTICLE! You need to be a WTTU Member to Watch this Training, Get One Now! It starts with God working in you and ends with His plans. As you set out to practice, make a commitment to yourself and to your band. Recently, we talked about the following: Can each person in the band devote themselves to practice at least 10 minutes per day? Can each member play their own part well among others – in the mix? Can each member implement these changes during the time of worship, and not just react like a deer-in-the-headlights, and revert back to the same playing habits? As a #WorshipLeader and a #WorshipTeam It may sound impossible, but with God, all things are possible. Be the leader He has already called you to be. The starting point is closer than you think, all you need to do is take one step forward. Whether we take our worship across the sea or across the street, one thing’s for sure, we must take it outside the walls of our church—to a world that desperately needs to see our praise and trust in the Lord. Learn for yourself in this webinar with Dwayne Moore will share how being a “next level” worshiper must include being missional with our worship. He and Branon will also discuss practical ways we can lead our worship teams to share their faith and disciple others through worship. Discover what it means to have God give you powerful principles that will impact your missionary leadership forever. Dwayne Moore is an author, speaker and worship leader coach. He is president of Next Level Worship International, a non-profit ministry serving worship leaders around the world. Dwayne has written numerous books, including the award-winning Pure Praise: A Heart-focused Bible Study on Worship as well as Pure Praise for Youth (co-written with Mark Hall of Casting Crowns). Dwayne has spoken and led worship in more than 1000 churches, and he has served as worship pastor in both small and large congregations. He and his wife, Sonia, live in Huntsville, AL. #WorshipLeadersOnAMission Wednesday: May 24, 2017 @ 2pm CSTLive Webinar + Full-Video Playback, Slides, Notes and Mp3 Audio recordings. Enrolled at Worship Team Training University? Use a webinar coupon to get the PLAYBACK and view this webinar at a reduced rate or for free! Not enrolled at WTTU? Click here to choose from 3 enrollment levels. THANK YOU TO ALL ENTRIES! 1 – “Baptize Me” by Kevin Nichols. By entry fee or membership only, all submissions are for unsigned (no signed artists / Publisher agreement) independent songwriters. You may not enter if you already have a Publishing Label contract or previous (past) agreement. You cannot have any published or previously published co-writers on your song submission. Entries may be submitted as an individual or by a team of writers. Each contestant or group, can only win once; there cannot be two or more winners by the same group of writers. Any submitted song that is found to infringe on copyright, the entry/person or winner will be removed from the contest. – WTTU members are able to submit 3 songs for free! Go to WTTU.co to enroll! How to submit your song? Thank You For Visiting The Worship Songwriting Contest! As a worship leader, do you ever feel a lack of confidence leading your team? As a team member, do you feel inadequate to fulfill your role as a singer or instrumentalist? God has equipped each of us with many gifts and abilities that He wants us to use for His glory. 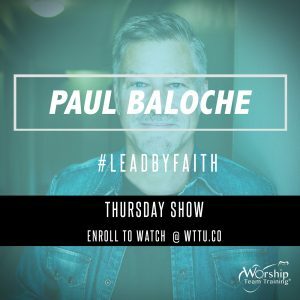 Join special guest Paul Baloche on this week’s show as we explore how to lead by faith, and letting Him work through us as we lead others. You won’t want to miss this special training show! Learn what it means to lead free, by faith and with full confidence!